At Compass Academy we believe that all students, regardless of previous learning challenges, can succeed and become lifelong learners and leaders. Our educational program infuses a strong values-based culture and additional people power with evidence-based practices to maximize student success and the delivery of individualized interventions. Our integrated and academic and social-emotional curriculum is centered on enabling deeper learning and the development of 21st century competencies. The 21st century competencies reflect both academic and socio-emotional outcomes. Our curriculum, in alignment with the Colorado Academic Standards and the Common Core State Standards, will prepare students in grades 6 through 12 to master core academic content, think critically to solve complex problems, work collaboratively, communicate effectively, reflect on and incorporate feedback, and become autonomous learners. Compass Academy is committed to building on students’ primary language skill by also developing them as bilingual/bi-literate students. For non-native English speakers, this means that they learn English skills as well as gain and deepen skills in academic Spanish. For students whose primary language is English this means that they receive Spanish world language instruction. graduation so that they can qualify for the Seal of Bi-literacy. All students will also receive a Spanish Language class that is differentiated and focuses on Academic Language across all content areas in preparation for the Spanish AP exam. Beyond this, Compass Academy will offer classes in Social Studies using Spanish as the primary language. Additionally, Compass commits to developing a bridging model from English to Spanish in each unit in ELA, math, and science for all students. 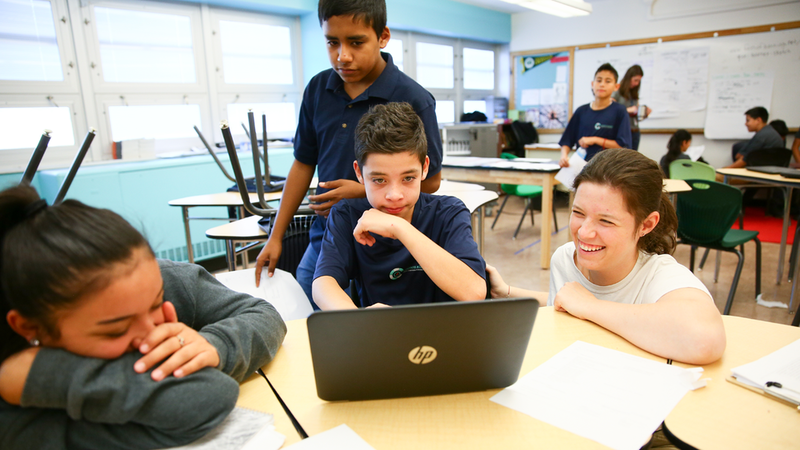 As a school, Compass Academy is dedicated to finding qualified teachers in both English and Spanish languages. Compass Academy’s Language plan ensures every Culturally and Linguistically Diverse Student is placed in an English Language Development (ELD) Class based on the student’s English proficiency level. Students are Identified for ELD levels and initial placement based on ACCESS data. Students are Re-identified for these levels and move ELD levels based on a careful evaluation of the student’s proficiency on multiple data points. All ELD classes follow the WiDA standards and focus on ensuring students are on-track in their English Language Acquisition. Teachers at Compass are trained to address the needs of Culturally and Linguistically Diverse Students. Language instruction is core for each content and differentiated scaffolds are used to support all students. Some strategies include using word walls, accountable talk sentence stems/frames, close reading, and language bridging differentiated for the needs of the students in a diverse classroom. Our Values represent our school’s deepest beliefs about how we develop into strong Learners & Leaders. They guide how we learn, the decisions we make, and the way we work with each other. Within each Value live the key skills and Learner & Leader Competencies that develop engaged citizens who are prepared and equipped to make a positive impact on our community and the world. In the diagram below, we can see how each Value is fueled by three Learner & Leader Competencies.